Weddell Seal basking on the ice. Animals have evolved to wonderfully conform to the environments in which they live, and animals that live in particularly extreme environments have some particularly amazing adaptations. 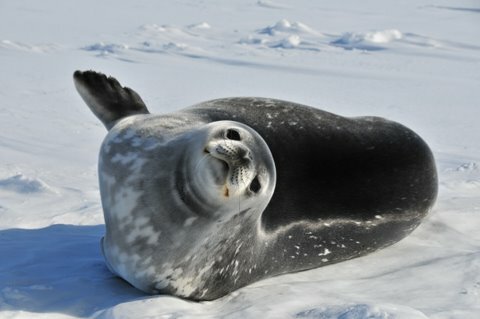 One such animal is the Weddell Seal (Leptonychotes weddellii). With a large and stable population (estimated at around 800,000 individuals) and the ease with which humans can approach them, Weddell Seals are one of the best studied seals in the southern ocean. These relatively large seals eat a wide variety of fish, krill, crustaceans, and other prey items including the occasional penguin or other seal. The Weddell Seal has the most southerly range of any mammal on earth living, as it does, in the waters along the edge of Antarctica where is spends a lot of its time under the sea ice. Such habitat is a pretty extreme environment in many ways. One of these ways is the extreme cold that Antarctica experiences. The sea water around Antarctica is actually below freezing for much of the year and only remains liquid due to the salt content. Like the water, the air over Antarctica is also very cold which causes another extreme condition, namely extremely dry air. Cold air does not hold a lot of moisture and this is one of the contributing factors that make Antarctica one of the largest deserts in the world. 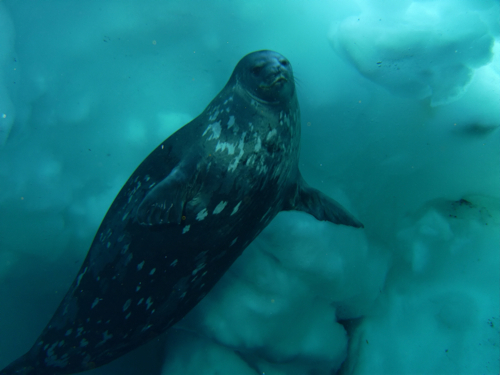 Weddell Seal under water off the coast of Antarctica. And in the midst of this coldness and dryness, lives the Weddell Seal. Being a warm blooded animal in the Antarctic Ocean presents a lot of challenges to even the simple parts of life, like breathing. Breathing is something that we all take for granted. For a Weddell Seal, it is not so trivial. Every time you or I breathe out, we lose heat and moisture. Just put your hand in front of your mouth and exhale to see what I am talking about. Multiply these losses by the numbers of times you breathe each day, and all that lost moisture and warmth begin to add up. A Weddell Seal simply cannot afford these losses. So what’s a seal to do? They have a bunch of adaptations that surround their breathing. One is that they have incredibly cold noses. These seals have blood flow that circulates in such a way that as warm blood goes out towards the tip of the nose, the warmth is passed off to blood that is returning to the body. This is called counter-current flow and it results in the nose of a Weddell Seal being pretty close to freezing most of the time! Inside this cold nose are some really large nostrils which have enough surface area for the seal to modify the air it is breathing. The major way that air is modified is in the retention of heat and moisture. As the seal breaths out, warm air leaves the lungs. As the air gets into the freezing cold nose, most of the moisture in that warm air condenses on the inside of nostrils. This allows the seal to capture the water, and with it the warmth, before the air leaves the body completely. The air that then gets exhaled is extremely dry and cold, just like the outside. When the seal then inhales, the moisture and warmth in the nostrils are there to make the incoming air more breathable. 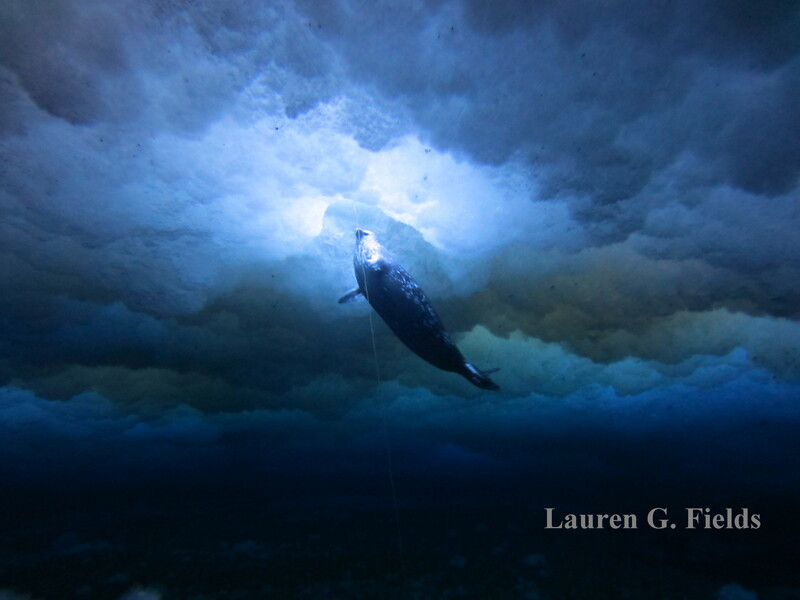 Weddell Seal surfacing from under the ice to breathe. Previous Post Field Notes: Ryane’s first field season at Chicken Camp!